It’s the night before the night before Christmas and I thought I would wish all of my one reader a Merry Christmas and Happy New Year since I won’t be around for the holidays. I did go jogging yesterday, but I don’t think I’ll be jogging while visiting family. However, you will be glad to know that I have packed my snowshoes and I do intend to use them. We have a ton of snow here and I think if I even tried to jog, it would be more like stair climbing. Ya, no. I can just imagine me trying to manage my body through snow drifts that are almost as tall as me. This, I am sure, would not be fun to do. No thank you. Besides, I’ve heard that changing up your exercise plan is a good thing. After all, you wouldn’t want me to get too bored with just jogging all the time, would you? Anyway, I will leave this here and see you in the new year. We are smack-dab in the middle of the holiday season. You know, when Thanksgiving runs into Christmas, and Christmas runs into New Years. Thank God I don’t have a birthday to consider during this time. Why? Because during the holiday season I like to cook and I like to bake, but mostly, I like to eat. My holidays seem to be centered around food and that is fine with me. However, I realized that if I am going to be fine with all that, then I also have to be fine with my annual weight gain… hmmmm… ya, not really. This year, I hope that things have changed somewhat. Don’t get me wrong. I am still cooking, baking and eating, but this year I have added jogging to the mix. What does this mean in the long run? Well, only time will really tell, but I think it can’t be a bad thing. I sure have been feeling a lot better about myself lately, and that’s always good. If I still end up gaining weight during this festive time, I will re-look at what I need to do with my diet. I know I probably should be doing that anyway, but the way I see it is I am starting an exercise routine that will hopefully become a habit in my life. Right now, I am focussed on that and seem to be staying the course. I don’t want to add a new diet regimen on top of a new exercise plan. In my thinking, (Yes, perhaps slightly skewed.) I feel that doing that would set myself up for failure, and I certainly don’t want or need that. You’ll be happy to know that yes, I am still jogging and still enjoying it. And yes, I did say enjoying it. I think losing weight can be a little addictive. I get so happy even when I lose just one pound. However sometimes, in the back of my head, I get this little voice that says, “Oh that? That’s just water.” Stupid voice. It is usually followed by suppression and a little rejoicing over my huge loss. 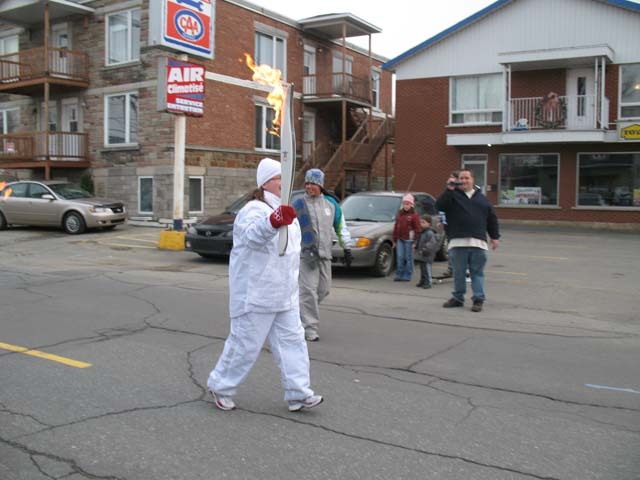 I am also still ecstatic over participating in the torch relay; I can’t believe it, really. The fact that I worried about this, exercised for this and then did this is truly amazing to me. It is now also really motivating. I can’t come this far just to quit exercising. I’ve made too many gains to quit. I just have to keep moving. I can’t believe it’s come and gone. My small part in the 2010 Vancouver Olympic Torch Relay was actually 300 meters and boy, did it go by fast. Don’t get me wrong, it’s not because of the lightening speed I ran. (Lightening speed is overrated anyway.) It is just that 300 m is not very far, especially with everything going on around you. It was almost sensory overload. The atmosphere was electrified. I don’t think I can remember so many people happy, excited and cheering at one time… especially during a recession. It is something I will never forget. Okay, so I may have looked a little like the Stay Puft Marshmallow Man from the movie Ghost Busters in my humongous track suit, but I didn’t care. I was living something historic, something beyond me, something… dare I say, epic? I can now say I played a part in the Olympics. Unbelievable! This event moved me to tears (good ones), made me laugh and made me smile constantly; now I know what models feel like. Yes, I know I don’t have legs for days, nor the Linda Evangelista looks, and I certainly wasn’t trying to make a fashion statement, (No offense to Stay Puft Marshmallow fashion officienados.) but I just couldn’t stop smiling. I was on an omnipresent high at a time when I most needed it. (I, like many others unfortunately, am not recession proof.) I thought to myself, I wish I could feel this way all the time. When times are down and I am feeling low, I need to go back to this moment; this amazing day to bring myself back up. Making my way down the road. So, what’s next for me? I will continue my jogging; it would seem that participating in a Torch relay has great fringe benefits. Beyond that? Your guess is as good as mine. Looks like I’ll continue posting, jogging, getting healthier and hope you return here to find out with me. Saturday is coming up fast and furious and I am getting anxious… or nervous, or both. If you are not in the loop, that is the day I carry the Olympic torch. Yup, this coming Saturday. The 5th. The one after this coming Friday; I can’t believe it’s almost here. Am I ready? Yes. Am I nervous? Yes. I have had (and still have) many “Gawd, I hope I don’t… ” kind of thoughts running through my head, but every time I start this kind of thinking, I stop myself before I finish the phrase. Whew, that was close! Last night I tried on my Olympic track suit (for the second time). It is still way too big for me. I am only 5′ 1″ (I think that is about 1.54 metres). Why did I order a large you ask? I am now asking myself the same question. Their lovely unisex sizing chart coupled with my hips that are genetically predisposed for hugeness gave me no other choice. However, I should have known that with the training I had intended to do, I could have ordered a medium. But at the time, I thought my past experience with the Buy it Now, Lose the Weight Later Plan hadn’t really worked all that well for me. So the only way to go was to err on the side of largeness. I could almost wrap the arms of the jacket around me like a straight ja… forget it… let’s not go there. The legs? We just won’t discuss the legs. Suffice it to say that at least I have ample room to layer. I may not look stylish, but I will be warm and comfortable.